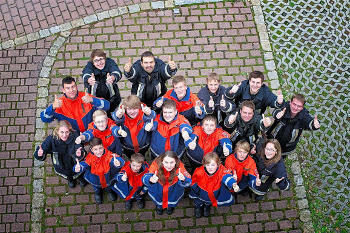 In Germany you can enter the volunteer fire department at an age of 12. As a junior firefighter you get a basic training until you are ready for service at an age of 18. We have had junior firefighters since 1972. From that time, about 100 youngsters got their basic training as a firefighter. Half of them were conscripted for essential service. These are about 70% of those who are now doing active service. A big part of the leadership (e.g. chief, chairman, officers etc.) results from this youth work.